The Missions of the Pass of the North (El Paso & Cd. Juárez) are far older than those in California and the San Antonio. They are located in the Mission Valley, a short distance east of El Paso, Texas in Ysleta and Socorro and San Elizario. 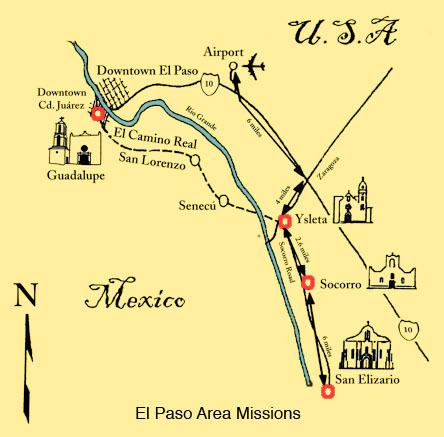 Guadalupe Mission is situated, across the Rio Grande, in Cd. Juárez (Chihuahua, Mexico). The missions, located 12-24 miles southeast of downtown El Paso, are accessible by car, bus and guided tour. Ysleta and Socorro missions and the San Elizario Presidial Chapel are east of downtown El Paso in Texas (USA). Guadalupe Mission is across the Rio Grande in nearby Cd. Juárez (Chihuahua, Mexico). 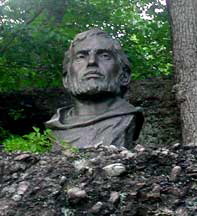 In 1598, a small group of Franciscan missionaries and Spanish colonists traveled north from southern Chihhuahua to the Santa Fe area with to establish the new province of New Mexico. The friars founded missions among the Indian Pueblos from Taos in northern New Mexico to Ysleta del Sur in El Paso, Texas and westward to the Hopi Mesas. The Franciscans with their Native American parishioners, built missions at the Pass of the North, which included Guadalupe, Ysleta and Socorro. The Ysleta and Socorro missions were placed on the U.S. National Register of Historic Places in 1972. The Ysleta and Socorro missions, and the San Elizario Presidial Chapel (all in Texas), and Guadalupe Mission (in Cd. Juárez, Chihuahua, Mexico) cannot be visited in one day. More time is needed to "walk with the padres" and leisurely explore the mission and its respective community. The missions are not museum relics, but living churches. It is advised that tour groups call the church offices in advance to avoid conflicts with religious activities.